The High Heavens and the Burning Hells clash, quite literally, in a battlefield that represents their everlasting struggle. Two Immortals, ancient warriors locked in a duel to the death, need your help to prevail against their eternal foe. Vanquish the enemy Immortal, and you’ll find yourself charging over hallowed or profane ground—right onto the enemy’s doorstep. Click on the image to see an enlarged and more detailed version of the map. These objectives are what makes the Battleground unique, and are essential to know in order to win. Immortals The Eternal Conflict rages on. 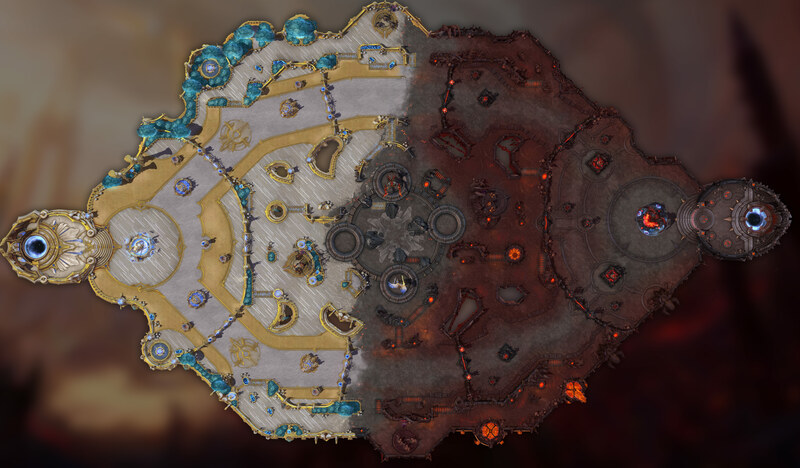 Every once in a while, the Immortals from the High Heavens, Ilarian, and the Burning Hells, Beleth, battle near the center of the map. Defeat the Enemy's Immortal first, so that your Allied one can aid you. The Immortal prioritizes the lane with the most Enemy Structures. Spawns at: 00:03:00 Respawns 00:01:45 after the sieging Immortal has been defeated. When captured at the right time, Mercenaries can make a huge different on any Battleground. Note that these are disabled during the PrimaryObjectives. Khazra Camp Khazra Impalers (Siege) spawns. Spawns at: 00:01:00 Respawns 00:03:00 after the Camp has been captured. Fallen Camp Fallen Shaman (Bruiser) spawns. Spawns at: 00:01:00 Respawns 00:04:00 after the Camp has been captured. These entities are found in this Battleground, one way or the other. Ruthless Demon, that fights the Eternal Conflict against Ilarian. Noble Angel, that fights the Eternal Conflict against Beleth.